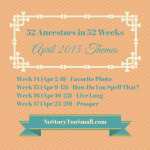 Posted in 52 Ancestors Challenge on March 5, 2015 by Amy Johnson Crow. Wanda at Footprints in Time shares the story of the house that was home to four generations of her family — and how she got answers about its history. Diane Tourville of Genealogy on My Mind wrote about a fight that broke out over cleaning a rug — it’s a great example of what you can find in newspapers! 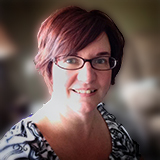 Michelle on Leaves and Nuts asked, “Where do the facts end and the story begin?” Her post shows how she broke down the elements of a family story and tried to prove (or disprove) them. My post this past week was a tribute to Tommy Young, my first cousin once removed. I never had a chance to meet him. When I added “close to home” as this week’s theme, I knew I wanted to feature Tommy. He was killed close to his home and close to where I live now. You know the drill: Add a link to your post in the comments below. Be sure to include the name of your ancestor and maybe a little bit of context (location, time period, etc.) While you’re here, take a look at the posts from Week 8. So many good posts to read! Finding my grandmother’s genealogy notebook among my Dad’s possessions led to new research avenues, further collaboration with my Kiwi cousin, finding all 11 of my great great grandmother’s children, and re-examing my great great grandfather’s birth date. WILDER, Laura Elizabeth (Ingalls) – Wife of a distant cousin – and fellow writer. Since I couldn’t find anyone close to where I call home – I went with ‘close to my heart’ instead. CARRUTHERS, Ford Ross and his brother Carl Stuart CARRUTHERS who both lost their lives as airmen in WW2. How horrible that must have been for their parents! Close to home is the language we speak in the region I live. You find it anywhere else in Germany or in the world. I chose to write about Patrick Smyth (1809-1861)-my ggg-grandfather who settled his family closest to where I live now. The WILDINGER-PÖPPELREITER family couldn’t get any closer to home. They lived in the Echternach, Luxembourg, my hometown, the place I’ve lived for the past 40 years. My ancestor close to home was my grandmother Mae Zawodna Pater. I called her Nan, and we lived together for sixteen years. The closest physically to me – there are many in Lancaster alone, let alone the County – would be Charles Eckman. I also closed with mention of my Aunt Helen who is close to my heart! 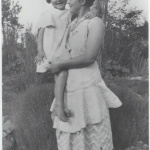 What a fun thing to find in your family tree – enjoyed perusing your blog this morning! This is the story of how I found unsuspected relatives in my own back yard. I’m not numbering them this year, just dropping them in where they fit. I’m putting my great grand-aunt Grace here, as she was always at home as long as she was with family it seemed. I can really relate to that given the number of times my family moved as I was growing up. Now I just refer to whereever my parents are living as “home” even though, as now, I’ve never lived there. Margarite Mae Witzke Denton Lovelace (1899-1966), my maternal grandmother. She is “close to home” in the sense that, of my four grandparents, I knew only two of them–my father’s father and my mother’s mother. She kept her stories to herself, and as I wrote this entry, I thought many times that “knowing” her probably got in the way of writing her story more than it helped me to see the real person. The HEALY Sisters – Charlotte and Arlette – married two RICE brothers nearby… close to home! Joseph Kaser was the first of my father’s ancestors to be born in North America. But unlike the first ancestors in America on my mother’s side, who landed with the Pilgrims in New England (Bless those early New England Puritan villages for their record-keeping! ), the wave of German who flowed into Pennsylvania left scant records. I can’t tell the story, when I don’t KNOW the story. I can only share the bare facts and hope a cousin will emerge who knows more. Louise Nelson and her husband came from Minnesota to be pioneers in Saskatchewan on the Canadian prairies; I spent the first years of my life in what had been their homestead home. Joseph MAY (1760-1841) lived in Boston his entire life. In exploring what I have for him, I decided I would have really liked to know him! I wrote about my great grandfather, who lived next door. He was a hard-working man who did whatever it took to provide for his family. Where I realize a one-name study just might find me a slew of “cousins” I’d never heard of…and then find them. Sort of. My father-in-law was a realtor in Victoria BC Canada where we live, and he and his family occupied many different homes in the area during his lifetime. 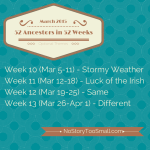 This week I decided to feature some of the homes that my ancestors lived in. My gg grandparents, William and Ann Jane (KNIGHT) FLEMING settled not far from where I live now. I decided not to use the theme this week. I wrote about my paternal 2nd great grandfather Henry Kerr from Sampson County, NC. Last night I had a brainstorm. Like many genealogists I spend too many of my sleeping hours mulling over my current brick walls. I can’t remember what led me to begin thinking about the birth place of my 2nd great-grandmother, Mary Catherine Strausser, daughter of Peter Strausser and Sarah (Mumma) Strausser. I remembered that I estimated her birth date around 1843 based on the above 1850 US census. It suddenly struck me that I could track her birth against the tax assessment information that I have on her father, Peter Strausser [Strasser]. So this morning, I completed that task and here is what I found. I didn’t know my grandmother very well growing up. However, I found out that we had a lot more in common that I knew. 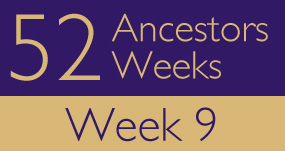 Week 9 of the 52 Ancestor Challenge: My maternal grandfather, David MOORE. PHILLIPS, Anna Julia married WOODLEY, HR in 1869. They had 2 children and lived in Chicago. We have half a dozen great photos of her, but didn’t know much about her. My Grandmother’s brother, Clement Stefani, was the youngest of seven children and he lived next door to his parents. His house became the one the family would go to every weekend to “go home” and visit each other. Hi Melissa! Welcome! I’ve added your blog to the list. 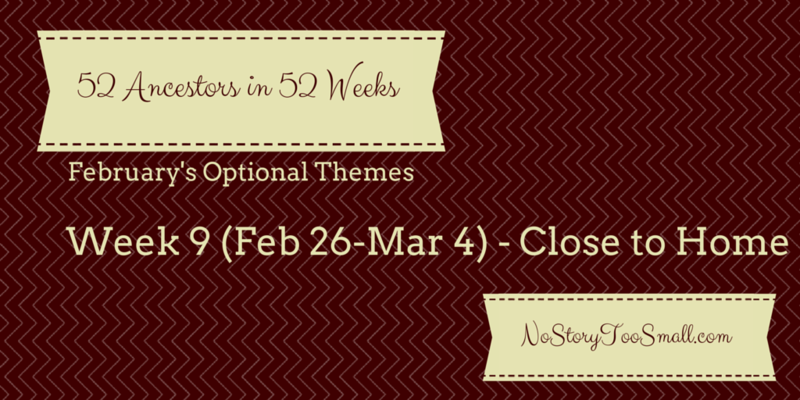 Each week, I do a “recap” post where participants can add a link to their post for the week. These are on Thursdays. Just add your link along with the name of your ancestor in the comments. I hope you enjoy the Challenge! This challenge brought a bad childhood living with my only sister “close to home” to me. It wasn’t until I began preparing my story did I discover how near to the farm I grew up on was my great grandfather’s farm. I’m sure as a kid I biked past the farm on my journeys through the neighborhood and never knew it was his farm. Doggerland, the ancient, submerged home of ALL my ancestors. Your post is interesting! I enjoyed learning about Doggerland’s existence. Lived closed to us when we lived in Kingman and I never knew about him until this year. TOURVILLE, Oneida (née Alexander). Once again, great finds in old newspapers.